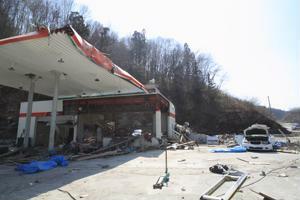 The earthquake that hit Mashiki, Japan Thursday night, killing nine and injuring at least 800, has caused serious supply chain disruptions for many of the region's manufacturers. The Associated Press reported that the 6.5-magnitutde earthquake wrecked homes, collapsed entire buildings and destroyed expressways. The natural disaster, which occurred around 9 p.m., had a depth of 11 kilometers, or 7 miles, and forced about 44,000 people to seek shelter and safety. Although it did not cause any major disturbances to nuclear plants, many areas lost their access to water and power. Organizations that have been impacted, however, include some of the country's biggest manufacturing facilities. According to Bloomberg, Mizuho Securities Analyst Kenichi Saita explained in a report that the aftershocks of the earthquake are still a reverberating risk throughout the region. Although smartphone chipmaker Sony Corp. halted production, Saita said it shouldn't drastically affect the firm's supply chain because Sony is well prepared to transfer its operations to other manufacturing plants in the country. However, if it does cause delays or disruptions in production it could lead to a decrease in sales - which could signal a larger economic issue for businesses throughout the country. Bloomberg also reported that Sony shares dropped 3.2 percent on Friday. The Tokyo-based factory is not the only electronics maker to have paused operations to inspect factories and ensure the safety of its works. According to Reuters, Honda Corp., Toyota Motor Corp., Mitsubishi Electric Corp. and Bridgestone Corp. have all suspended production until investigations are complete, though none of plants was damaged. The source revealed that a Toyota Motor spokesperson said the automaker will resume operations throughout its supply chain "at the first available opportunity." Although this recent natural disaster was not as severe as the earthquake and tsunami that hit Japan in 2011, it still bears the potential to hurt sales for many businesses across a wide range of industries, highlighting some economic fears and concerns. Mizuho Securities Co. Chief Market Economist Yasunari Ueno told The Japan Times that the country has had a weak and fragile economy and that any unplanned disruption or disaster might force the region into a recession. According to the news source, the transportation industry was also affected, with disruptions to both airline and train companies. One train in Kumamoto was derailed and All Nippon Airways Co. and Sola-seed Air Inc. flights were canceled. The Japan Times explained that, prior to this earthquake, the city had already been struggling with business activity, especially pertaining to travel. A Kumamoto branch of Bank of Japan revealed that confidence in business throughout the area is declining. This quake highlights the effects natural forces can have on operations and production, as well as the importance of supply chain managers implementing a sound risk management and disruption response plan. The disaster preparedness of an organization is a large reflection of its enterprise agility.